Buried in Legos ...: What NOT to hair ... Fight the Frump With Fussy !! What NOT to hair ... Fight the Frump With Fussy !! Don't go overboard on your hairstyles. Your hair is not a pet nor is it a pencil holder. Those are some crazy hair don'ts. yikes! Ha! I was just thinking I need to take a poll. 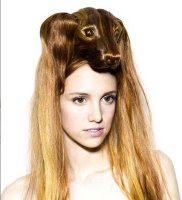 I am a chic and stylish hair girl. I was the Posh Spice of the world, way before Posh Spice. (grin) Until my husband announced he liked long and flowing hair on me. Not chic, just long. So for a few years I've complied, like a good wife. Every day I hate my hair because it doesn't feel like me. Every day my husband loves my hair. What is a wife to do? sometime during my pregnancy with my third, my stick straight hair decided to CURL. So now I have this waviness that is amazing for lazy hair moms (hello, bumble and bumble tonic and a spritz of spray). Let me know if you try the green smoothie, and you'll be platinum since you already have a Vitamix! Wow. Where did you find those? The pencils would be handy. But possibly dangerous. Cybersalt.org is where the pencil pic came from. Just saw the hair pic again yesterday. Still looking for site. Google was no help. I can proudly say that I have never used my head as a pencil holder or a pet perch! The animal hair will give me nightmares for weeks. Uh, thanks. Get the The Daily Spurgeon widget and many other great free widgets at Widgetbox! Get the Blissfully Domestic widget and many other great free widgets at Widgetbox! Get the Verse Widget widget and many other great free widgets at Widgetbox!